In 1980, Margaret Lindsay Holton, or just Lindsay in this piece, a fellow Canadian, designed the lovely typeface Lindsay, and contacted Letraset to market it. The story of how she was misled, lied to, cheated, and taken to the cleaners, involves all major players in the type industry, i.e., Letraset, URW++, ITC, Monotype, Fonthaus, and many others. She contacted me in 2007, and finally, in January 2012, she gave me the green light to post the story. Her files, emails, contracts, and so forth, are with me, but I am resisting a Wikileaks approach---a dump of all I have. It would take me weeks to make sure that I got every unwanted item (like bank account numbers) blacked out. However, I am reproducing her story, verbatim, as she told it in a 2007 document. The letter, reproduced below, is entitled Respectfully prepared & submitted to Doug Shaw CEO, Monotype Imaging, and J.Meeks of TA Associates by Margaret Lindsay Holton, February 12th, 2007. In brief, I originally licensed my hand-drawn typeface design Lindsay in 1980 to Letraset, England, to the then Type Director, Colin Brignall, for use in their flourishing dry transfer market. Everything seemed fine until I stopped receiving statements and royalties in 1991 from Geoff Fisher, the Royalty Accountant for Esselte Letraset England. The monies paid out at that point were small, under $50 per annum, and I just naturally assumed that sales of the face had come to a timely end. I asked Colin about this. He replied in 1992 that Letraset was busy converting all our faces into digital form---Lindsay would feature in 1993. In March of 1992, Colin wrote, Lindsay was not available as a digital font. I thought the matter closed and did nothing further about it. However, quite by chance, I discovered Lindsay in a Fontshop publication in 1995 at the Design Exchange in Toronto. I phoned the Fontshop and they said they had licensed the digitized Lindsay in 1992. I wrote Colin in March of 1995 asking for an explanation. Nothing in my royalty statements indicated third-party licensing or digitization of my face. Colin stonewalled. I became concerned, and hired lawyer John Maycock as legal counsel in England to investigate further. Colin replied to him that ITC was responsible for all Letraset third-party licensing and had the sales reports from 1994, 1995. I thought this odd. Maycock wrote that Colin had said ITC was extracting figures from Elsner & Flake of Germany for 1993, 1994. Again, I found this unusual. I knew nothing of Elsner & Flake, let alone ITC's owner/partnership. And what had happened to an accounting for the year end of 1991, 1992 and 1993? I wrote to the Board of Directors of the parent company, Esselte in Sweden, requesting full disclosure and a complete statement of activity concerning my type design. Jack Forbes of Esselte USA responded saying he would investigate. Mark Batty, then CEO/President of ITC, a subsidiary of Esselte, eventually assumed responsibility and said a statement and monies would be forthcoming. Included at that time was a Letter of Intent that I was asked to sign and return. ITC agreed to Termination of the Agreement between Letraset and myself, but claimed, It was not feasible to revoke third-party licensing to various distributors. ITC also agrees to pay royalties at 10% on those existing agreements. Mark Batty declared that ONLY Elsner & Flake and Fonthaus were licensed. I signed the LofT, adding an Addendum, requesting confirmation that ITC assume full reporting and accounting responsibility on behalf of Letraset. The Addendum was accepted. In October of 1995 I received from ITC a Royalty Analysis of Letraset Lindsay to June 1995, including a $100 cheque as a termination bonus of my Agreement with Letraset. I reviewed the summary, found many irregularities---including the supposed issuing of cheques over the years that I had never received. I pointed this out and received a reply from Randy Weitz, Comptroller at ITC in December of 1996. He issued another cheque for $307 to compensate me for my troubles including the accounting irregularities. He reiterated the claim that ITC had only licensed to Elsner & Flake of Germany. No dates were given. No mention was made of Fonthaus by him. I let it alone and let ITC assume the running of business affairs for Letraset. The year of 1996 passed and I heard nothing. No sales statements, no royalties. In early December 1996, I wrote to Elsner & Flake asking for a direct sales summary of the Lindsay face to ITC. I wrote again to Mark Batty at ITC asking for a statement. Randy Weitz responded saying he would look after it. On January 24th, 1997, I received a fax from President Veronika Elsner at E&F saying that she had sold at least 12 fonts of Lindsay during 1996, ITC should know as we reported to and paid them quarterly as agreed in our contract dated 1990. She also disclosed a list of seven other companies that carried Lindsay in their digital libraries. This information was contrary to what ITC and Letraset had thus far reported. I immediately demanded dissolution of my Agreement with ITC via Urban Janson, CEO of Esselte Sweden, ITC's parent company. In February 1997 Jack Forbes of Esselte USA supplied a fax containing Royalty Statement for the preceding five quarters, a letter to E&F directing them to henceforth remit all royalties directly to me, and an ITC letter relinquishing all Rights to Lindsay to me. In June of 1997 I received a cheque from ITC for $1.20 US, for third-party licensing royalties past due. My relationship with ITC was seemingly, formally, finished. However, to my mind, there were still a few loose ends. I had established an alternate connection at ITC with a backroom Royalty Accountant. After several more inquires she reported that URW++ had signed a blanket Agreement with ITC in 1990 that entitled them to the Letraset Library of 328 faces, including the Lindsay Typeface. That was the first I had ever heard of URW++. Neither Esselte, Letraset nor ITC had ever reported this connection. In February of 1998, this same backroom accountant, sent me a check for $23.05 with a letter stating that the sum represented the full amount sent to us by URW++ for the first 2Qs of 1997. She also included a copy of a letter issued from ITC to URW++ informing them to send all future royalties directly to me. In May 1998, she wrote that URW reported a total of 64 units of Lindsay sold on their unlocked CD products (TypeWorks2, Eurowork2 and Design Collection) for those first 2Qs of 1997. No further monies nor statements were sent from ITC. I wondered what had happened to the license to Fonthaus, but said nothing, and let it go. This whole thing grows tiresome as you can well imagine. ITC was sold by Esselte Sweden to Agfa Monotype in 2001. I figured that was the end of it. I entered into new licensing Agreements immediately with Elsner & Flake (1997) and URW++(March 1998). Elsner & Flake seem, to date [note: 2007], to be honouring their Agreement, and I am relatively happy with their reporting and remitting of royalties. URW++, however, are quite another kettle of fish. In February of 1998, Peter Rosenfeld of URW++ wrote that the original URW (now bankrupt) did the original digital conversion for Letraset in 1984-1985. It would appear that Colin Brignall, as an employee of Esselte Letraset/England, for whatever reason, blatantly lied to me. My guess is that some kind of contra swap deal was struck between URW, who supplied the digitally converting IKARUS software, and Letraset (thru the partnership with ITC), who supplied the type library for conversion. I doubt I'll ever know for sure how the deal was done. I, as designer, was completely left out of the loop, illegally, and financially. 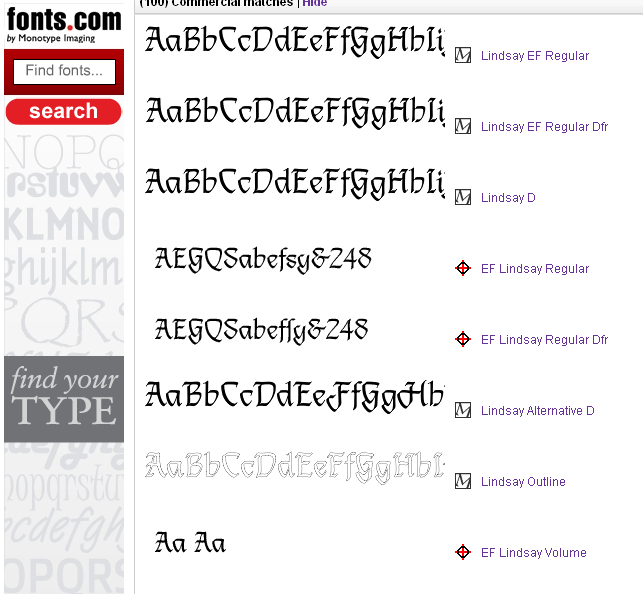 As of March 4th, 2002, Lindsay was listed on myfonts.com under four foundries: E&F, URW++, Linotype and Letraset. The Letraset Foundry had Lindsay listed as No.44 in popularity out of 457 of their offered typefaces. Lindsay, however, was not offered for sale via Letraset. 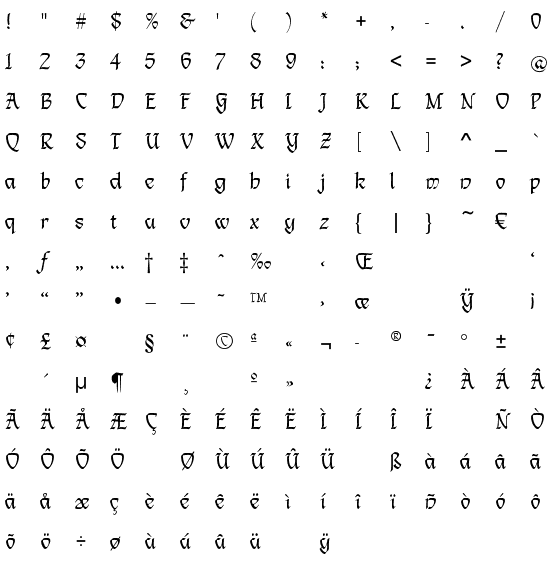 The font was available for purchase at that time through URW++. At that time, myfonts.com offered the parent design of Lindsay (listed with Linotype---licensed from E&F in 1992), and child versions by URW++ and E&F. Myfonts stated on the website that they are the same design. Today, February 12th, 2007, URW++ markets five stand-alone versions of the individual typeface design Lindsay thru both the ITC website, and the MyFonts website of Monotype Imaging: Lindsay D, Lindsay Alternative D, Lindsay Outline, Lindsay CE (D), and Lindsay Alternative CE (D). They have also been actively marketing these versions over the past decade through an assortment of CD-ROM Collections, including Typeworks2, Euroworks1, & 2, Design Collection, Font Collection, Typeworks Light, Typeworks 1, and 2.Version.1. When I have approached Peter over the years about these obvious knock-offs via e-mail, I receive curt and incomprehensible replies. As an example, when I queried about the sales of the face thru the CD-ROM collections, he responded in writing, we are not going to pay royalties for Lindsay when it is sold on any of the CD-ROMS because we purchased these good from the former URW company which went into bankrupt in 1995. If this was so, I queried, why did URW++ continue to remit royalties to ITC on the CD-ROM products until 1997? (see above: 64 units in first 2Qs). He never replied. From the third quarter of 1997 to year-end of 2001, URW++ declared no sales of any kind. I found this most odd, and highly suspect. I received my first royalty payment from URW++ in 2005 for the grand sum of $60.00. (US). Yet, the abundance of the Lindsay face would seem to suggest both interest and purchase. Why would his business develop an assortment of illegal versions if it wasn't selling, or if they didn't feel they could make money off it? When I recently, and again, queried him [URW++'s Peter Rosenfeld] about the various versions of the face available now via ITC and Fonts by Monotype Imaging, Peter was, again both dismissive and evasive, writing, ITC is a separate organization owned by Monotype US. They sell their own version of your Lindsay typeface. You might want to contact Mr. Allan Haley at Allan.Haley@MonotypeImaging.com. He can certainly provide the information about the ITC version. On September 7th, 2006, I sent an e-mail to Robert Givens, then CEO of Monotype Imaging. Quoting the above from Peter, I then asked, Would you kindly explain to me how this is possible? With whom do you have a contractual Licensing Agreement? I never received a reply of any kind. After 3 more attempts, I gave up. I turned to Meeks at TA Associates, a controlling shareholder. Gentlemen, it appears to me now that I am back to square one with ITC. Not only is ITC aka Monotype Imaging seemingly marketing an assortment of versions of my typeface, but they are, according to Peter Rosenfeld of URW++, actively producing it as well. The URW++ website only carries 3 versions of Lindsay. It is very curious that ITC and Monotype would be carrying 5 URW++ versions. It is all still highly suspect to me and, from an ethical point of view, somewhat shocking and shameful. Your web copy states that you frown upon typeface vendors who have built their libraries by copying typefaces from esteemed foundries. Some of these vendors make minor changes to the original design so that the copied version is not an exact duplicate of the original. Don't you think it high time that you practise what you preach? At this point, I now seek redress again from ITC, aka Monotype Imaging, for the sale, promotion and collection of royalties for my typeface design, Lindsay. I request, again, a full disclosure of third-party licensing deals, including a complete summary of any Fonthaus activity past 1984-85. I also request a detailed statement and summary of continued collected royalties from URW++ (thru both collections and individual versions of the face). I request that these statements re: URW++ commence from 1990 onwards. I do understand that the monies themselves in this case are small. However, we are way beyond that at this time. As an artist and designer, my work is my hand. To steal from me, in whatever hybrid-knock-off version you all create, while I live and breathe, is an indignity I am no longer willing to endure. I seek restitution and recognition. Please comply. As a result of this letter, Alan Haley, under authority of President Doug Shaw, at Monotype Imaging/ITC, removed all URW version/variants from both websites. All stand-alone Lindsay fonts previously listed under the URW foundry as well as the Letraset Fontek library (sold via URW++), were removed. Alan Haley claimed ITC has no further contractual obligations towards Lindsay, but that appears to be untrue. There are plenty of emails in Lindsay's correspondence files. There are also hard copies of her license agreements and contractual arrangements with Letraset, Esselte, ITC, Elsner & Flake, and URW++. Fonthaus material, however, continues to be non-existent, though they clearly also licensed the face from ITC in the 90s. Tangentially, Albert-Jan Pool, in a lengthy correspondence with Lindsay, provided some valuable insights into the early days of URW and Elsner&Flake. All in all, the development of the IKARUS system invented by URW's founder Peter Karow was very good at producing variants of typefaces. The Lindsay typeface with the 5 known knock-offs by URW++ are testament to that. In July 2007, Lindsay wrote this note. I have now concluded my research about the apparent breach of contract by Letraset concerning my hand-drawn typeface design, Lindsay. In conclusion, both Letraset and URW acted with impunity between 1980 and 1982. Both Chris Escritt of Letraset, and Peter Karow or URW, as signatories of a servicing deal, willingly engaged in the transformation by automation of my formerly hand-drawn typeface design using Karow's Ikarus software system. They did this with the clear understanding, and ambition, that automated variants or versions could be created from the original design. This was done without my knowledge or consent. In summary: I licensed my hand-drawn typeface design, Lindsay, to Letraset in 1980. It was my understanding that the face would be used in the dry transfer market. My Agreement was signed by Colin Brignall, then Type Director at Letraset. In September of 1980, Letraset bought a service contract from URW. This deal was signed by Chris Escritt, on behalf of Letraset, and Dr. Peter Karow, principal of URW. A new business entity was formed to take advantage of this union, TSI Typeface Systems International, a subsidiary of Letraset. During the time frame from 1.9.1980 to 31.12.1982, Lindsay was used as a test font by TSI. This was done without my knowledge or consent. A very recognizable and somewhat difficult face, (class c in URW literature), it was ideal to demonstrate and modify both the strengths and weaknesses of the evolving Ikarus system. Once this face had been integrated into the storage data, variants and/or modifications could easily be manipulated. Veronika Elsner writes in a letter to me of 15.9.1997, I graduated from design college in 1977 and was taught to draw letters with a pencil too. By accident, I was introduced to the ARISTO (product of plotters) who started to digitize letterform and plot it automatically. This is how I came into the business. Later I visited Letraset in England as a freelance. I learned how they produce their dry transfer alphabets. 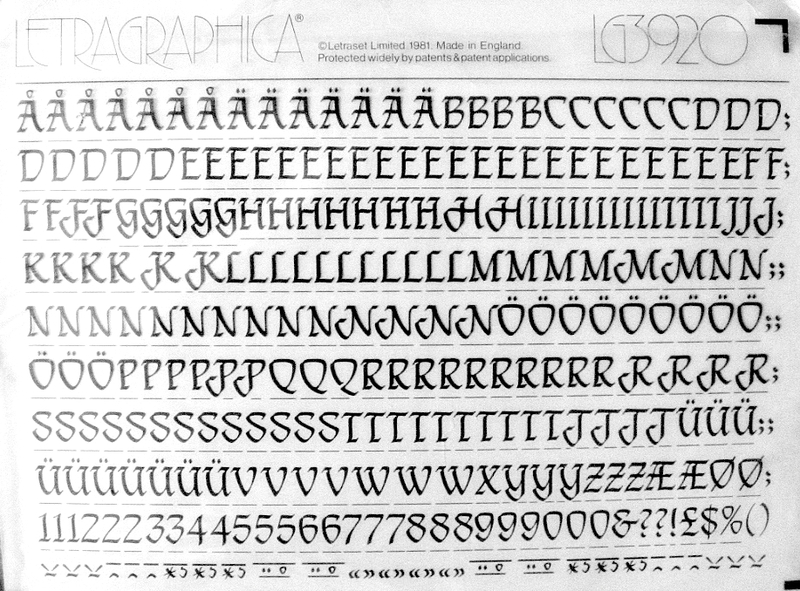 Letraset started to digitize letters in 1979. They digitized a light and a bold version and produced the intermediate weights with the computer and the plotter. They earned a lot of money with dry transfer. What has become clear is that the now automated data of the Lindsay typeface travelled in two directions. It returned to URW's typeface division, under the then management of Veronika Elsner & Gunther Flake, and it also remained at Letraset. Both companies utilized the data in different ways. By 1983, URW was marketing Lindsay under its SIGNUS system, product code of L-L004000-C. A brochure from this time period claimed that Lindsay was under ownership of Letraset. Whether they actually paid any kind of licensing fee to Letraset seems a somewhat mute point. Colin Brignall wrote in March, 2002: Once everything went digital the same studio staff were trained in the production of the Postscript/TrueType masters which were marketed under the Fontek banner from 1991/1992 until the disbandment of the studio in 1995/1996. ITC continued to market these fonts until 1999. My royalty payments abruptly stopped coming in from Letraset in 1991. When I asked why, I was told that the dry transfer market was dead. I never knew, or received royalty fees, from Letraset for use of the Lindsay data. Nor did I receive any 10% royalty as I should have as per our initial Agreement as a result of those third party deals that began in 1980. I did not know any even existed until 1995. 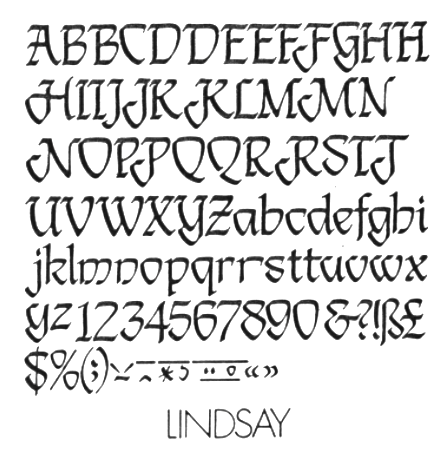 Lindsay was never formally launched as a digital face by Letraset, even though the hand-drawn outlines had by this point become in-house computerized data. Colin Brignall's letter of 1992 confirms this, as he wrote: We are busy converting all our faces into digital forms for use on computers---Lindsay will feature in the Spring of 93, and his follow-up of March, 1993, Lindsay is not available as a digital font. Letraset would not market its own digital font version of the Lindsay typeface, because, by this point, E&F and URW were well out of the gate with Lindsay. My subsequent discovery of Lindsay as a digital font in a Fontshop product brochure of 1995, prompted my first investigation. Fontshop had licensed the face from Elsner & Flake in 1992. The Lindsay data was used by Elsner/Flake when they left the employ of URW. URW and E&F used the same data bank, according to Albert Jan Pool, in correspondence of June, 2007. In the meantime, Esselte Letraset re-structured its licensing procedures and handed over the job to the newly acquired sister company, the International Typeface Corporation of New York. Mark Batty, then President of ITC, claimed this was done in 1996. Yet, according to Veronika Elsner of E&F, she, and others, were paying licensing fees for Lindsay since 1990. One wonders to whom? URW meanwhile began marketing several additional versions of Lindsay as early as 1993. Called variants, 5 versions of Lindsay were available through URW's TypeWorks2 collection. By 1994, Lindsay D and Lindsay Alternative were also included in the URW DeSign Collection, again claiming license from Letraset in 1980. My name was also included in the registered ISBN sales brochure. (ISBN-3-926515-17-1). I never even knew URW existed. There were no third party deals listed at 10% in my new Esselte Letraset/ITC royalty reports of that time. When URW went bankruptcy in 1994 Peter Karow reportedly had tears in his eyes when the receiver closed it down. When URW++ resurrected in 1995 with Peter Rosenberg at the helm, Lindsay and versions continued to be marketed and sold by URW++ as stand-alone fonts. Today, URW++ claims it has always paid a licensing fee to Letraset/ITC. 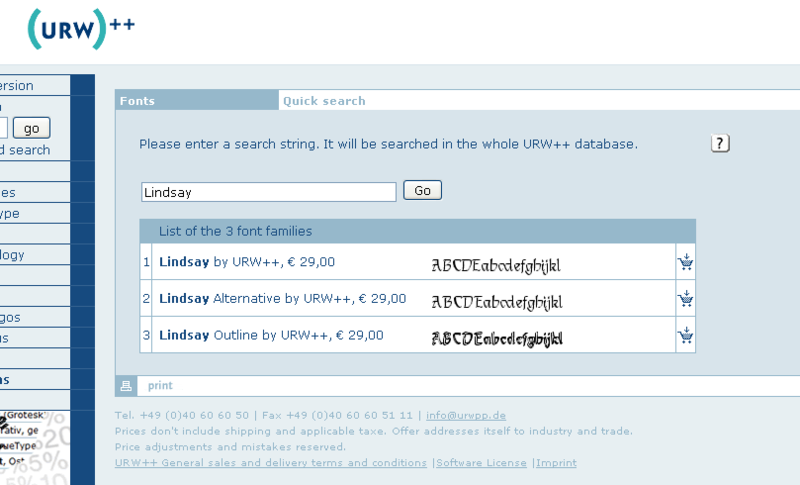 Neither Alan Haley at ITC or Martin Gibbs at Letraset say they have any kind of Lindsay licensing agreement with URW++. This contradicts what the licensing accountant reported at ITC in 1997, URW licensed the Letraset 368 font package including Lindsay in 1990. Today, Alan Haley at ITC says there is no blanket agreement that includes Lindsay on file. There is an accounting gray-zone regarding Lindsay between 1980-1990. And, to repeat, no URW Lindsay versions or variants have ever been authorized by me. The Ikarus software had been designed from the get-go to create variants. I dissolved my relationship with Esselte's ITC/Letraset for failure to disclose third party revenue. By 1997/1998 I was basically forced into new contractual Agreements with E&F and URW. (They already had the Lindsay data, what did they need me for?) A very loose, and now manifestly inappropriate, Agreement was signed with URW++ . As of March of this year, 2007, I have asked URW++ to compensate me for its years of infringement, and known knock-off versions. I requested $1000 US and an amendment to our existing Agreement. Peter Rosenfeld, as principal, has refused on both accounts, claiming URW has always paid a licensing fee to Letraset/ITC. He is very cavalier about our dealings and always have been. By what Right did Letraset give URW the permission to create variants and versions of the Lindsay Typeface in the first place? Not mine. Rosenfeld is clearly not bothered at all by the knock-offs. Closing remarks: It is clear that Lindsay was used during the union of URW/Letraset, under the operational banner of TSI, to test and modify the evolving Ikarus software. Lindsay slid from Letraset when the data traveled to URW, and was subsequently re-worked, using the data supplied, by URW, and then URW++, to create the known stand-alone font versions of Lindsay Outline, Lindsay Regular, Lindsay D, and Lindsay Alternative. This was done off the original TSI Lindsay database. There is seeming little I can do about any of this now. TSI dissolved 1982, and URW went bankrupt by 1995. And yet, the fact remains, my face was used and integrated into the subsequent business entities of both Letraset/ITC and URW++ of Germany. ITC continued to collect revenue from third party licenses which I knew nothing about up until 1997, and URW++ did whatever the heck it wanted with the Lindsay data. In conclusion, both Letraset and URW acted with impunity between 1980 and 1982. Both Escritt and Karow as signatories of the deal willingly engaged in the transformation by automation of my formerly hand-drawn typeface design using the Ikarus software system. They did this with the explicit understanding that automated variants or versions could be easily culled and created from the original design. This was done without my knowledge or consent. My initial Agreement with Letraset allowed them to reproduce. Not alter, modify or knock off. Nothing in subsequent royalty statements from Letraset, ITC or URW++ acknowledge or compensate for this basic, brutal and rather bold design infringment. Martin Gibbs, current President, of Letraset England and Peter Rosenfeld of URW++ have not answered any additional queries since May, 2007. It is now time to correct this situation. URW are guilty of knock-offs. Known variant/versions currently for sale are Lindsay Alternative and Lindsay Outline. Deliberate obfuscation, lying and cover-up by Letraset has occurred. Everyone there conveniently forgot to mention the deal with TSI of 1980. No-one mentioned either the bankrupt URW or current URW++ or the Ikarus system to me until 1997 and 2007 respectively. That is 27 years after I first signed with Letraset. I seek legal damages from Letraset. For pain & suffering. 27 years is long enough. My support material is extensive. A binder and a half. And I intend, somehow, to make URW++ sign Amendments to our Agreement as stated above, with one addition: NO additional Lindsay variants can be produced, without my express permission. Any additional variant will demand an additional licensing fee to be negotiated prior to production. I would also like them to pay a small pain & suffering fee---I have asked for $1000, but think that now $10,000 would be more appropriate, all things considered. What do you think? They may all claim the Lindsay data, but I will ever claim the original Lindsay design. Lindsay wrote this to me: As predicted, I never heard from Peter Rosenfeld. So, presumably, the matter is "closed" from their end. Meanwhile, they retain the "knock-off" data files as "assets". As such, I now give you permission to utilize the info previously supplied to you in any way you see fit. As time passes, and most everything graphic becomes digital, there will be very few who will care about real 'hand drawing' anymore. Still, historically, it's all kind of interesting about the evolution of type design, especially as the Lindsay typeface was clearly an Ikarus test font. 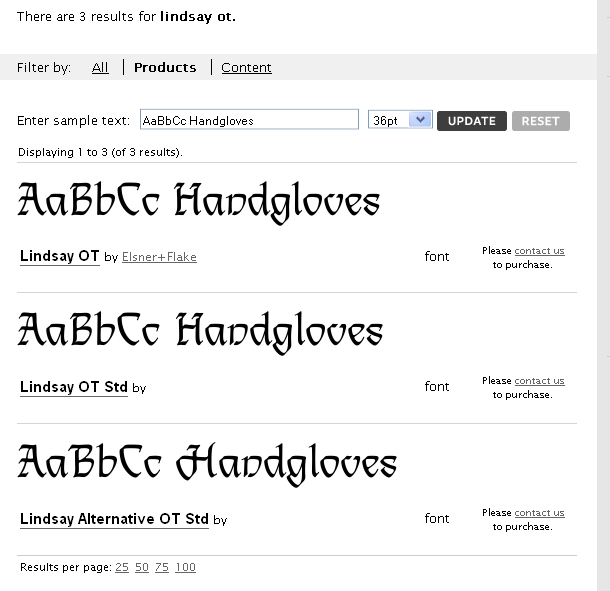 I checked the web, and found that URW++, MyFonts, and all other standard sources for font purchases do not offer Lindsay any more. The 30-year ordeal seems to be over, except, of course, for the permanent scars caused by three decades of mental anguish. Consider these pages as a contribution to the historical record. For those looking for Lindsay's files and contracts, they are locked on my main computer, on my web server (but not accessible to the public), and on two other computers in two different cities. The original hand-drawn pencil drawings of Lindsay were, according to Colin Brignall, deposited at the St.Brides Library in London, by Colin. However, after numerous requests by Lindsay to Nigel Roche, Head Librarian, to locate them, they are not to be found. Lindsay now has it on good authority that her original drawings are, in fact, in the private collection of Günther Flake, of Elsner&Flake. Time will tell. In closing, it seems somewhat ironic that for all the assorted manufactured production of the digitized Lindsay typeface, not one global manufacturer thought to give the original designer a digital copy of her own work. Lindsay Holton does not own a digital version of her own typeface design, Lindsay.